2. Hey, How Are You? 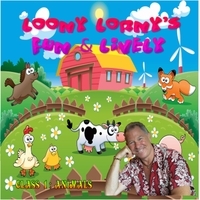 Loony Lorny Shatner has been a popular Montreal area children's musical entertainer since 1988. Yes, he is a cousin to that other Galatically famous Montreal Shatner, so you can be sure that Loony Lorny is out of this world! He provides a fast-paced, dynamic musical programme for kids from newborn (why not??) up to 6 years of age. This is the first in a series of CD’s exploring fun musical themes. A dynamic, energetic musical class is what you can expect. The pace is quick and lively so your children will be fully engaged with this fun half-hour! - I've known Lorne for about 15 years , since my eldest started doing mom & tot music lessons with "Loony Lorny"! All 6 of my kids went nuts for Lorne and his lively, funny , shticky tunes. -Lorne was so full of energy and was amazing at engaging my son. to my now 2 year old. -Lorne has a gift with the kids and we look forward to listening to his CD, over and over again. -We loved doing his classes and my children are always excited to see him at music on the park or at a birthday party".